Most people start email marketing with the right goals in mind. They want to increase revenue, attract new customers, and strengthen relationships with their existing audience. When done correctly, an effective email marketing strategy has the potential to help marketers and business owners hit all of these business goals. But then they struggle with mastering effective email marketing. They feel lost, not knowing what to send or when to send it. In the end, they send out an underperforming email or just give up without sending anything at all. Either way, they’re leaving money on the table. Before you begin, make sure to print out the worksheets below to guide you through the process. Using these worksheets and the directions below, you’ll create a simple campaign plan designed to make your email marketing a success. Note: Steps 1 and 2 should take a total of 15 minutes, with step 3 taking another 15 minutes. For this step, use the Email Marketing Opportunities worksheet. This worksheet lists all 12 months of the year, along with some blank spaces next to each. Take a few minutes to jot down the important dates for your business to give yourself a big-picture view of the year ahead. Do you hold an annual summer sale? What about special events to promote your nonprofit to your target audience? Fill in those important dates now. Do you have any months without much going on? Don’t worry. These slower months can still be great months for your business. Use the 2018 Holidays worksheet to be creative and get email newsletter ideas for open months. Are there any holidays on this list that your email subscribers may relate to or any that would be a good fit for your business? Fill in any empty months on your Email Marketing Opportunities worksheet with major or little-known holidays — like World Chocolate Day or Book Lovers Day. Hint: Even if the holiday doesn’t directly relate to your business, you can find effective ways to use it in an email campaign promotion. For example, on World Chocolate Day you could offer free chocolate to everyone who visits your retail store. Getting creative like this opens a lot of ways for you to interact with your subscribers. By taking a few minutes to jot down your ideas, you’ll have a plan to communicate with your potential customers, loyal followers, and subscribers at least once a month. For this step, use the Email Marketing Calendar worksheet. This calendar may look simple, but it’s essential to achieving your email marketing goals of increasing revenue, attracting more customers, and fostering stronger relationships with your loyal subscribers. 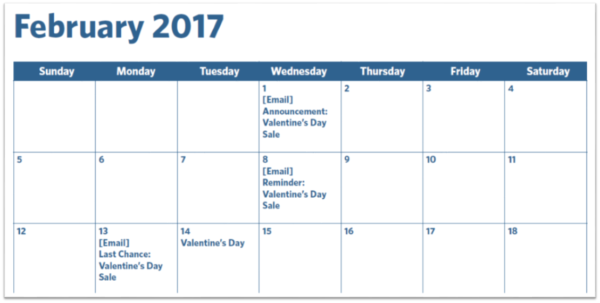 Use your completed Email Marketing Opportunities worksheet to mark the important events and holidays from each month onto your Calendar worksheet. Then, decide if the opportunity requires a time-based promotion or a non-promotional email. Hint: A good email marketing calendar should include both. Time-based promotions contain time-sensitive information and encourage your email list subscribers to take a specific action, such as buying a discounted item, registering for a new class, or buying tickets to an upcoming show. Here’s how you could start filling in your calendar to plan for this promotion. Non-promotional emails, on the other hand, will be less sales-driven and timely, and more focused on building relationships and providing value to your customers. While promotional email campaigns generally tend to yield a higher click-through rate, non-promotional messages allow you to see what interests your email subscribers so you can segment accordingly. You can follow up later with more targeted messages that help to nurture your relationship with these audiences. Think of this as a regular monthly update to your audience. Tip: For non-promotional emails, try offering an educational video or a blog post with advice. This might seem like a lot to do all at once, but don’t worry. Even if you aren’t able to plan the entire year in one sitting, having just three months planned will help guide your email marketing strategy and reduce your stress. With your first 15 minutes, use your Email Marketing Opportunities worksheet to fill in important dates specific to your business/nonprofit. Then, use the Holidays Worksheet to fill in any gaps with major and little-known holidays that relate to your customers or business. With your second 15 minutes, fill in your Email Marketing Calendar with the dates from the Marketing Opportunities worksheet, scheduling a mix of time-based promotions and non-promotional emails. Creating a plan for your email marketing strategy may seem challenging at first, but by following the steps above you’ll have an effective and easy-to-follow email campaign plan in no time. This means you will be a lot closer to hitting your goals of increasing revenue, attracting new customers, and strengthening relationships with your existing audiences!